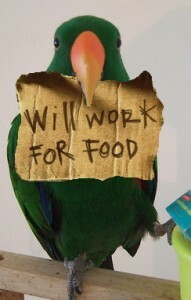 Give that bird a job! Many pet parrots have behavior problems such as feather plucking/barbering and screaming – and a lot of times, this results from boredom. Many parrot experts and avian veterinarians agree that occupying your parrot’s time is a good way to ensure a mentally and physically healthy parrot, and may help with the behavior issues, too. 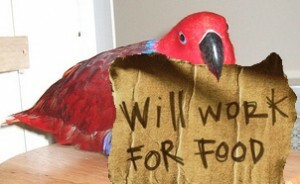 And even if your parrot seems happy already, he could be even happier if he kept busy by working for his food. Some studies have shown that parrots will choose food they have to work for, even if there is food available in the bowl! Some researchers call this “contrafreeloading”, and this is well observed in parrots. This is definitely true for my two Eclectus parrots. Wouldn’t it be great if you knew, when you went out to work, that your parrot is happily at work too, doing the type of job that he was born to do? You can definitely improve your parrot’s enjoyment of life by giving him opportunities to forage. There are many wonderful foraging toys and products on the market, and my birds love many of them. But let’s face it – they are VERY expensive – especially for parrots who like variety. That’s why I created this website. 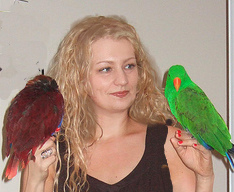 Since I got my Eclectus parrots, I have devised many home-made foraging toys that my birds love. This website will contain the instructions to make many cheap or free foraging toys that you can make yourself, very easily, with NO skill or complicated tools, and that your parrots will love, too! Join me in helping to keep those beaks busy with productive, positive activities!